Big game fishing from a sailing Catamaran? Of course. Why not surround yourself with luxury while waiting for the long whine of a game fish on one of the five fishing lines. Our catamaran is a near perfect platform for fishing. We sit flat in all conditions never rolling. 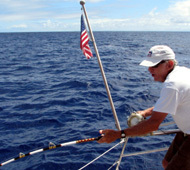 We have a large aft deck from which we set up to five fish poles from. When a strike occurs the angler can stand up fight the fish, or move to one of the two aft decks and and sit down for longer fights. 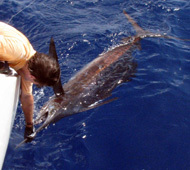 The deckhand positions himself on the lowest step below the angler to gaff the fish, or to release the larger billfish. Meanwhile the captain sits above the angler at the helm controls for fast backing and twisting. Because of our wide aft deck our props are placed nearly 25 feet apart allowing the captain to quickly turn, twist and control Mariah to keep you facing the fish. Tonga is known for near perfect fishing conditions. The flat water provided by the island archipelago means easy relaxed days, while the five mile deep Tongan trench just a few miles offshore provide swift underwater currents that lure in the largest of game fish. "The tournament billfish figures were incredible .... 115 confirmed billfish strikes, 82 hook ups and 33 tagged billfish – 2 Sailfish, 1 Striped Marlin, 1 Black Marlin and 29 Blue Marlin .... now that is world class fishing." Read the complete link here. and many other ocean predators. 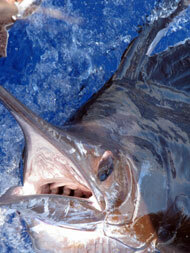 Billfish are commonly caught with a thousand pound Marlin being caught as late as October 2009. 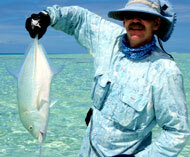 Many international fishing competitions come to Tonga every year including the Tonga Int. Billfish Tournament where boats averaged four strikes per day with a report here. Our Catana 582 is a superb fishing platform with two large aft decks to fight the fish. The two widely spaced 110 hp diesel engines allow us to quickly back down in any direction. Being a catamaran we don’t roll when broadside to the swells fighting a fish. We can easily sail or motor between 4 and 10 knots to excite lours of every kind. Remember sailboats are silent under the water. The fish are never spooked by the noise produced by our two thin hulls. We even use special feathering props so our boat can run silent, or start the engines to make all the noise of a conventional powerboat. Relax in comfort while waiting for the zing of the fishing line sailing the offshore FAD’s. Still, sometimes guest prefer to hire a local vessel. Such a fishing trip can be arranged with a personal pick up from your floating abode. 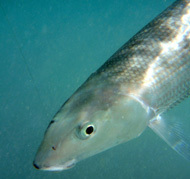 GT's abound in Tonga. We offer two packages for fishing the large hook and release Giant Travellie. Option one- Let us take you to the spots in our 14 foot rigid double floor inflatable. It's easy and comfortable for two to fish while our pilot tends the helm. Option two- Tongacharter.com has teamed up with a local fishing charter guide that provides a larger more stable high speed 22 foot, 140 hp dedicated fishing tender. The cost is slightly higher, but the fish strikes are better and we are able to service some of the farther and less known reefs in full knowledge that the mother ship is close at hand. World record Giant Travellie caught in Tonga shatters the world record! See full story here. 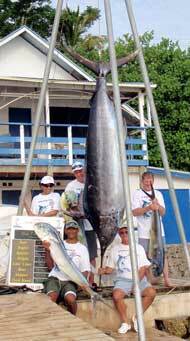 986lb Marlin caught in Tonga! See full story here.